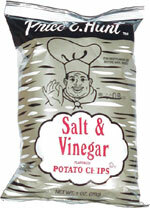 Taste test: These are good thin, tasty potato chips. The level of vinegar varied quite a bit from chip to chip, as some had an impressive zing and others were fairly bland. Salt levels seems to be in proportion with vinegar levels, as the same ones without much vinegar didn't have a ton of salt either. Impressively, most of the chips in this 1-oz. bag were large and unbroken. Smell test: Medium-strength vinegar aroma. Good.